This is fruit salad with a serious kick! 1. 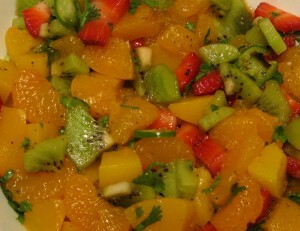 Cut strawberries and kiwi into cubes and do the same with the peaches if using fresh. Add to a serving bowl. 2. Drain all canned ingredients and add to the bowl. 3. Add sliced chillies, lemon juice, black pepper and fresh coriander and mix well using a spoon. Add salt if desired.